“Do you know what you’re doing?” It’s a powerful question. Many think it’s cool not to know and just live in the moment and go with the flow. But living like that, we eventually can feel forced by circumstances and end up saying and doing things we probably shouldn’t. In life we have so many situations to face, so many choices to make, and there are so many pressures. Should we have any conviction or direction? If so, how can we live by it? In today’s passage Jesus is surrounded by pain and disappointment from those closest to him, humiliation, and even an imminent threat to his life. Experiencing all these difficulties at once, most of us would cave. But Jesus is calm and cool. Why? Because he knows who he is and what he’s doing. How could he be like that? And why did he let himself get in to all this in the first place? As we think about his words to Peter, may God speak to us personally today. Look at verse 1. It’s a quiet scene. Behind it all was prayer. There was a secluded garden. It was a special hour when Jesus could be alone with his beloved disciples. But it was all about to radically change. Look at verse 2. The person who stands out in the story is Judas. It says he “betrayed” Jesus. “Betray” is a strong word. What does it mean that Judas did this to Jesus? Judas was one of the Twelve. He had shared life together with Jesus for over three years. He saw Jesus’ miracles, heard his words and experienced his love. But though he was following outwardly, he didn’t like the direction Jesus was going. He didn’t like it when Jesus wouldn’t feed the crowd again and instead told them that he was the bread of life and that they should feed on him (6:70,71). He didn’t like it when Jesus let Mary of Bethany waste expensive perfume on him (12:4-6). He didn’t like it when Jesus insinuated that he was inwardly unclean (13:10,11). Despite his double-mindedness, Jesus offered him his personal love to the end, but Judas refused to open his heart to it (13:26,27). Because of Jesus’ rebukes his pride was hurt. Inwardly he became critical of Jesus, thought he knew better, and it reached the point that now he wanted out. He knew this private garden where Jesus had often met with his disciples. He was so smart, he knew Jesus would be there now, with them. Judas might have had many justifications in his mind for what he was doing, but it was none other than betrayal. Look at verse 3. Judas guided the soldiers and officials to arrest Jesus. This detachment could’ve been as many as 200 soldiers, plus the officials. They were carrying torches, lanterns and weapons. Why? Because it was so dark, and they wanted to make sure to capture the right man. They also were expecting his followers not to let him go without a fight. Their collective power in that dark night seemed strong. But was it? How did they respond? Look at verse 5. “Jesus of Nazareth,” they replied. Jesus said, “I am he.” Again the author mentions that Judas the traitor was standing there with them. Why? It’s to emphasize something. We all would cringe to have to meet face to face with someone betraying us. But Jesus faced his betrayer and all those with him with courage. Look at verse 6. It’s a stunning verse. Why did this crowd of soldiers and officials suddenly draw back from Jesus and fall to the ground? Jesus had only said, “I am he”—what’s so scary about that? He wasn’t yelling; he made no threats. But it was the power and meaning behind his words. He was again saying, “I am,” which really meant he is God (1:1,2). He had no army with him, no means of self-defense, and he was totally outnumbered. But he had far more spiritual power and authority than all of them put together. He was fearless, whereas, despite their numbers and their weapons, they were inwardly fearful. What’s more, he was in the light, while they were in the darkness; he was living in the truth, while they were living in lies. This fearless, courageous, truthful Jesus is the Light of the world. He promises that when we follow him, even in very dark, hostile, overwhelming situations, we will never walk in darkness but will have the light of life (8:12). Look at verses 7–9. Here John emphasizes that at this moment, when Jesus was about to be arrested, he wasn’t thinking of himself; he was protecting his disciples. He was using his power not to save himself but to protect and save others. It wasn’t just good words; at this very real moment he actually proved to be the good shepherd who sacrificed himself so that the others could go free (10:11). Verse 9 emphasizes that in doing this, his own words were fulfilled. It shows how Jesus viewed his disciples, even though they were so weak. He saw that the Father had given them to him. Because of that, they were precious to him, and he was determined not to lose even one of them. What happened? Look at verse 10. Peter reacted emotionally, and with fear. He thought that in this situation, he just had to fight to protect Jesus. But he was reckless. He didn’t strike one of the armed Roman soldiers, but a lowly and unarmed servant of the high priest. And though he probably intended to cut off his head, he missed and just cut off his ear. What did Jesus say at this moment? Read verse 11. Though he was the top disciple, Peter was on a completely different wavelength than Jesus. It seemed he was fighting for Jesus, but he didn’t really understand Jesus at all. There are two important lessons here. Second, the cup. Jesus went on to say, “Shall I not drink the cup the Father has given me?” He was talking about the cup of humiliation, suffering and death. It was very distasteful, very hard to drink. But Jesus was determined to drink it. Why? He said the Father had given it to him. It meant it was the Father’s will for him. Jesus saw that his Father God gave him this cup, so he was willing to drink it. He knew that even though it was hard, the Father loved him, and he loved the Father in return. 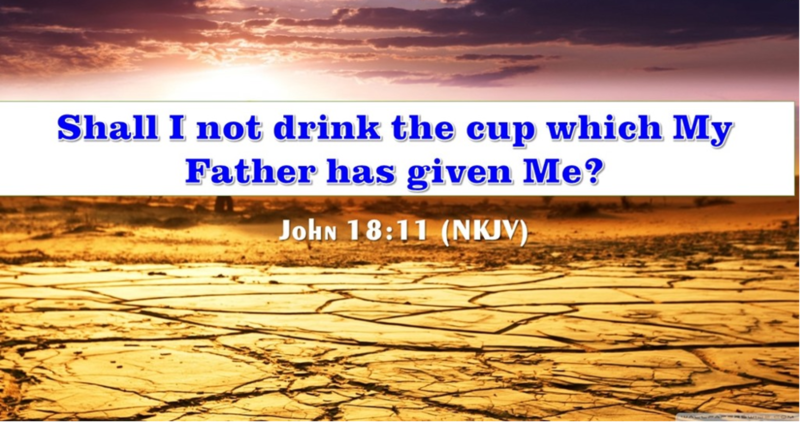 His obedience to drink the cup was the expression of his love for the Father. His personal relationship with the Father was reciprocal, both receiving and showing love. We too show real love for God when we actually submit to his will. Ultimately, by not shrinking back from this cup, Jesus was determined to save us, even though we’re so sinful. In doing this, Jesus showed each of us the greatest love ever known. This cup was a special cup only Jesus could drink, but in a sense it’s also for all his disciples (Mk10:38,39). The cup can mean our lot in life, including all the pains and griefs that go with it. But it especially means doing God’s will for my life. It’s unique for each person. To find God’s will for me, we shouldn’t be comparing ourselves with others or trying to fit into the world’s standards or living up to people’s expectations; we should be seeking God’s leading and what he really wants for me. It’s not just for crisis situations; it’s a lifestyle. And it’s never easy. It always requires self-denial and self-sacrifice. But it’s so worth it. 1 John 2:17 says, “The world and its desires pass away, but whoever does the will of God lives forever.” We can live our lives pursuing the things of this world, our own desires, our own ambitions, and in the end find that it was all so meaningless. Or we can focus our lives on doing the will of God, going through all the suffering, making all the sacrifices, and in the end find that we gained eternal life. We all need God’s help to really see what my cup is, in my life today. So, like our Lord Jesus, do you know what you’re doing? In verses 12–27 the author makes several contrasts. He contrasts Jesus with the high priest and his official. Jesus lived openly, whereas they were doing these things in the middle of the night, sneakily. Jesus speaks truth, whereas the official reacts violently against it. The author especially contrasts Jesus with Peter. Jesus was facing incredible scrutiny from the high priest Annas and his officials. Peter just had to face a servant girl in the courtyard. Jesus spoke truth and got struck in the face; Peter repeatedly lied and was warming himself. Jesus clearly identified himself, even though it meant certain death; Peter denied who he was three times. Peter really didn’t want to do this. He wanted to love Jesus and honor Jesus and fight for Jesus and even die for Jesus (13:37). So with all his zeal and passion and all his good intentions, why did he fail so badly? It was because he was depending on himself. When he did so, fear captured him and took over. Above all, Peter didn’t really accept Jesus’ words. Jesus had warned him earlier that evening that he would deny him three times, but Peter didn’t really listen to what Jesus said or take his words seriously (13:38). Like Peter, we can’t follow Jesus with our ability or loyalty; we have to hold to his words, even though they can be so hard, so personally convicting. Only then can we really live as Jesus’ disciples (8:31,32). Read verse 11 again. This Easter may God help us to experience the great love of Jesus, who drank the cup of suffering and death in order to save us. May God also protect us from human battles and show us what our cup is. May God help us to truly love him in return by making a new decision to drink our own cup.